During today's iPhone event, Apple announced that customers would be able to pre-order the colorful iPhone 5c beginning on September 13, but there was no pre-order date given for the iPhone 5s. Instead, Apple supplied only a September 20 release date for its flagship phone, which means the iPhone 5s will not be able to be pre-ordered ahead of time. Customers who wish to obtain an iPhone 5s on release day will need to visit an Apple Store or brick and mortar carrier store to purchase the phone. Apple will, presumably, begin accepting online orders for the iPhone 5s on September 20, but waiting in line will almost certainly be necessary to get a phone in-hand on the release date. 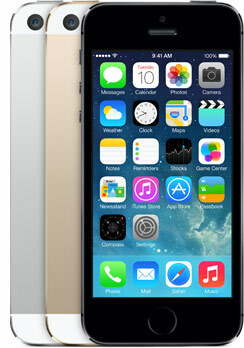 Apple's iPhone 5s comes with a 64-bit A7 processor, a Touch ID fingerprint sensor, and new camera enhancements. It will ship with iOS 7 and can be purchased in three colors, including "space gray", white, and gold. The 16GB version of the iPhone 5s will cost $199 with a 2-year contract and $649 unlocked and contract free. This is a stupid move IMO. What are they thinking? No pre-orders is absurd. There are many of us who don't have the time to sit in a line for days. Hopefully we can order online and pick up in store. My wife texted me today as she just bought the Iphone 5 in June and said..."Oh great thanks Apple you mean to tell me I paid $100 too much for my phone??" Seriously disappointed with lack of pre-order. Why have they taken this decision? In fact, this might actually stop me buying it. "Receive phone same day as everyone else in the world, not 3 days later" ? No thanks! Had my 4, 4S, and 5 on launch day without standing in line and I certainly won't be starting now. I have a job and a life. I can wait until whenever it shows up on my doorstep. Amateur move buying a end of cycle phone right before a refresh. That should teach Apple a lesson they'll never forget.